Home - Success for Hamlet Centre Trust Auction! 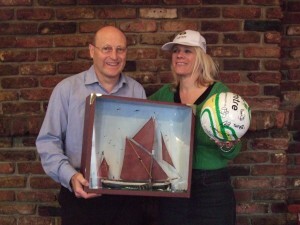 Success for Hamlet Centre Trust Auction! After speaking to Julia Snow, who helped organise the auction at the Trafford Arms pub in Norwich last Saturday, she was pleased to say that auction went rather well. “The auction didn’t go badly at all, all items were sold (apart from a rather odd Thames barge model in a box – that needs a true aficionado to want that…. ), and the total was £1200 raised for our St Raphael Club refurbishment campaign. The auctioneer was very professional and funny, so there was a lot of laughter. I was expecting a bit more of a crowd, given that the Trafford Arms is a big pub and has a large amount of regulars. The pub was full, don’t get me wrong, but the buying seemed to be coming from a smallish group of individuals at one end of the pub rather than from the whole crowd. To find out more about the Hamlet Centre and their cause feel free to click here. Anglian Home Improvements specialise in Double Glazing and high quality replacement windows and have been trading since 1966. For more information visit our website.